Total Payments Mexico is for B2C and B2B businesses wanting to learn about the newest and most innovative payment technologies that are driving businesses forward, to boost revenue and reduce costs. 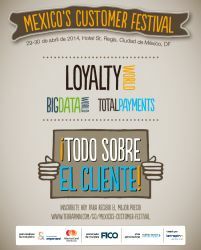 Mexico's Customer Festival, comprised of Loyalty World Mexico, Big Data World Mexico and Total Payments Mexico, will multiply the number of B2C businesses in attendance and create more opportunities for networking and thought-provoking discussions. At Terrapinn we realize that you not only attend our conferences for their world-class content, but also to network and build relationships. Hence we have several hours of dedicated networking time built into the agenda. Our events create the backdrop where ideas develop, connections are made, and inspiration grows. Bring plenty of business cards - you'll need them!